We went to the Greenpoint children’s Halloween party yesterday. Beforehand, we stopped by our friend, Caroline’s, for hot cider and pumpkin cookies. While the kids ran around in the backyard, I took a few pictures. Channon lent us the outfit because the idea Toby and I came up with fell through. Nevertheless, I think he made an excellent octopus. What are the chances I can get this puppy on Murray tomorrow? Previous Post Invest In Happy Memories. 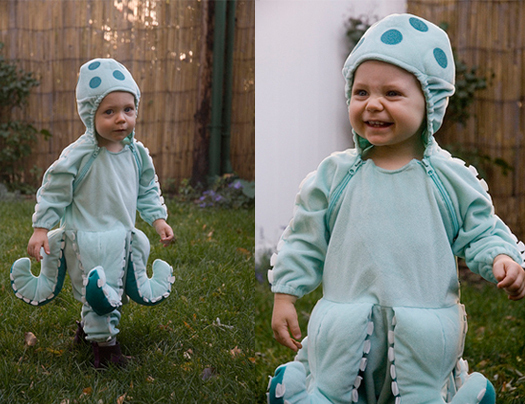 That is the cutest little octopus I’ve ever seen! He looks like he’s super happy. Adorable! Wait, wait, let me check…. Nope, he couldn’t get any cuter. Oh, holy crap. When I have kids, I am really hoping for boys! He is just the sweetest thing I have ever seen. And that costume is awesome! Good job Mom! Holy crap. I finally understand why people have children. The cute is overwhelming. Wow but he is simply adorable. I enjoy your blog a great deal and read it every chance I get. Thanks for writing it. I find it funny, provocative and Murray is a hoot.